This piece of jewelry is offered by BH 5 Star Jewelry with a promise that you are purchasing quality. Established in 2012, we take pride in having sold high quality genuine jewelry online for the past 5 years. Rooted in NYC's Diamond Exchange we make sure to provide the best jewelry at the best prices and paired with excellent customer service. If you have any questions please feel free to contact us. If you have any questions about this product by BH 5 Star Jewelry, contact us by completing and submitting the form below. If you are looking for a specif part number, please include it with your message. 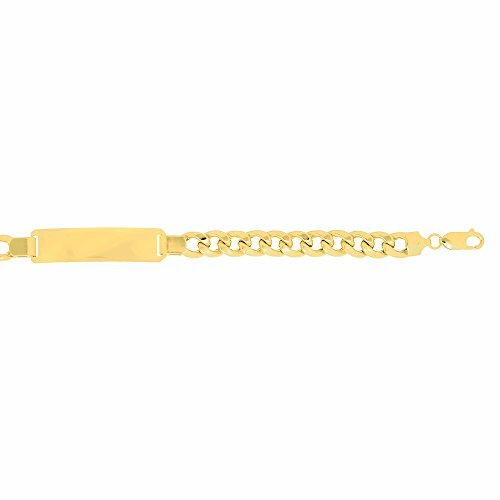 CUSTOM ENGRAVED - 14K White Solid Gold Stampato Oval Baby ID Bracelet - 6"
Ioka Jewelry - 14K White Solid Gold Stampato Oval Baby ID Bracelet - 6"
Ioka Jewelry - 14K Yellow Solid Gold Stamp Figaro Link Baby ID Bracelet - 6"
CUSTOM ENGRAVED - 14K Tri Tone Color Valentino Baby ID Bracelet - 5+1"
CUSTOM ENGRAVED - 14K Yellow Solid Gold Cuban Baby ID Bracelet - 6"